A promotional 4x10 custom printed four team football schedule coffee shop round corner magnet is being adjudged a next best thing after a cup of hot coffee because it stirs sports spirit in an onlooker! 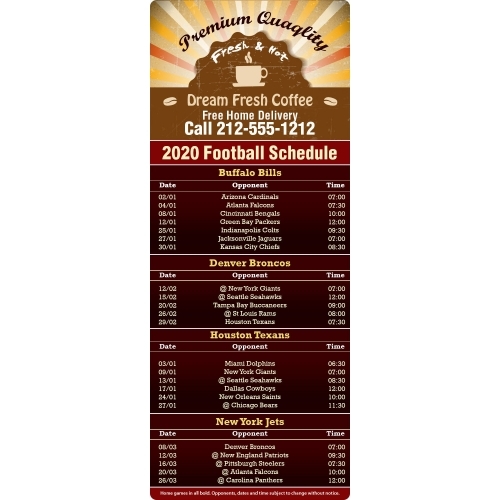 Coffee shops, restaurants or hotels, which are targeting youngsters or sports frenzy clients, can always rely on a custom 4x10 inch four team football schedule coffee shop round corner magnet to meet success. A personalized 4x 10 inch custom printed four team football schedule coffee shop magnet makes a great acknowledgement token, gifting choice or an encouragement gift in the season prior to the game. Product Size : 4 in. x 10 in.